Supports CPUs up to 50 lbs. CPU width Accommodates 3.75" - 8.25"
CPU height Accommodates 12" - 20.5"
What if my computer tower is over 50 lbs? 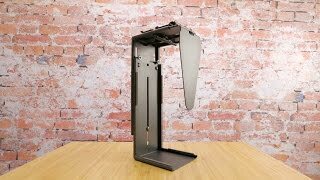 If your CPU is over 50 pounds then the UPLIFT Desk CPU Holder will not work. We recommend placing your tower on the floor, close enough to your desk so that it does not pull on the cords when you move your desk higher. Or you can place your tower on top of your desk. Where should I mount my CPU holder? You can move one of your desk legs inward a little bit and mount your CPU holder just outside of the leg. Or, with the included Track Spacer, you can position it under the desk anywhere you don't already have accessories mounted! My tower has "rings" on its outer edges. Will it fit? If the rings are on the bottom of your tower, then you are in luck! Bottom rings will not interfere with the rotation or fit of the CPU Holder. However, top rings may get in the way by preventing the holder from rotating. You can get around this by leaving a space between the top of the tower and the CPU Holder. My tower is just barely larger than the maximum size listed, will it still fit? Unfortunately, no. The maximum size listed here is firm. Consider another CPU holder that will fit your larger set such as this Humanscale CPU Holder. Can I use this for a battery backup system instead of a CPU? Yes, as long as the battery backup does not exceed the size and weight requirements for the UPLIFT CPU Holder then you will be fine. Is there any harm in placing 2 CPU holders underneath my desk? If there is enough room under your desk for two CPU holders, then by all means go for it! But you may want to evenly load your desk by placing the CPU Holders on opposite sides of the desk. What is the Track Spacer used for? UPLIFT Track Spacers let you mount CPU Holder tracks over your desk's crossbars underneath your desk, giving you the freedom to mount your most-needed accessories, even on smaller desks. You can see a Track Spacer in action in our Track Spacer Instructional Video. UPLIFT Track Spacers let you mount CPU holder tracks over your desk's crossbars underneath your desk, giving you the freedom to mount your most-needed accessories, even on smaller desks. Accommodates CPU Widths 3.75" - 8.25"
Accommodates CPU Heights 12" - 20.5"
This product comes standard with a 2-year limited warranty. For more information on UPLIFT warranty coverage, click here.